In the first pAsuram, knowing that parAnguSa nAyaki is determined to engage in madal, her friend stops her saying “this is forbidden” and parAnguSa nAyaki says “I have reached a stage where I don’t fear being blamed, as I have been captivated by his beauty”. First pAsuram. When the friend says “emperumAn is having no shortcoming or blemish in his beauty and qualities. Your act will cause him disrepute” and parAnguSa nAyaki says “I am not planning to cause disrepute to him, but am planning to remove the disrespute he already has”. EsaRum Uravar kavvai thOzhi en seyyumE? emperumAn is having unblemished thEjas, is having reddish mouth, is like an emerald mountain, and is enjoyable for me; he is having good qualities without any defect and is the one who first came and bestowed me the enjoyment and is my lord. Seeking such emperumAn permanently, I have lost the freshness/complexion in my body and have lost my wisdom since long time. What will the shouting that is fixed on scolding/blaming me by the citizens, do [to me]? mAsaRu sOdhi – If one [a woman] who united and separated with emperumAn, remains unperturbed and abides by the limits, it is considered as a fault on the other side [emperumAn]; if the one who became separated does not behave like this, it is a blemish for the beauty. parAnguSa nAyaki is saying, even if I have to cross the limits, I cannot avoid seeing him; while his beauty is such, how can I not engage in madal? Oh stupid [friend]! His form is opposite of all blemishes; and if I don’t engage in madal, that will cause a blemish to such form. I am trying to eliminate the blemish of “emperumAn will not present his form to those who consider it to be very dear”; the form which is said in jithanthE sthOthram 5 “bhakthAnAm” (for my devotees), if retained for himself, that is a blemish for such form. mAsaRu sOdhi – parAnguSa nAyaki‘s friend considers “engaging in madal” is a blemish; [but] parAnguSa nAyaki considers “not engaging in madal” is a blemish. If she does not go through such agitation in separation, emperumAn‘s form will also be the same as worldly forms which are seen by us. Since she has embraced emperumAn, she first becomes engrossed in his form. mAsaRu sOdhi – She is saying “See, as soon as we announce that we will be engaging in madal, he is arriving without any blemishes”. While his unblemished qualities are explained subsequently in “AsaRu seelanai“, she is first speaking about physical beauty, since physical form is more attractive than the qualities. 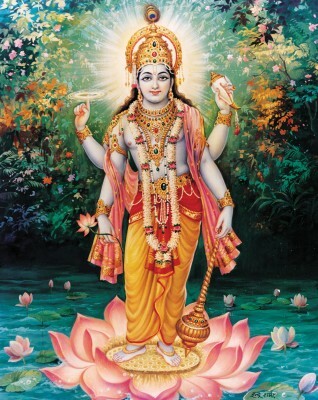 en seyya vAy – While emperumAn who is explained in chAndhOgya upanishath 3.14 “avAkyanAdhara:” (does not speak, ignores [in paramapadham]), after uniting with me, due to the joy acquired in that union, smiled and became totally transformed [while he is said to be unchanging], should I remain emotionless while in separation from him? Since there is no one on a par with him to have a conversation, he ignores everyone [in paramapadham]. Here, if we say that “there is no transformation due to uniting with his devotees” instead of saying “there is no transformation forced by karma [worldly action/reaction]”, then that will imply that there is no mingling with jIvAthmAs. In fact, it was his pleasant smile which he gave during the union with me, which made me pursue this upAyam (means) of engaging in madal. His joyfully smiling state is similar to the joy acquired by a samsAri [bound soul] while becoming muktha (liberated). en seyya vAy … – It is his distinguished form of smiling face due to uniting with her, which made her engage in madal. She is engaging in madal, facing his [smiling] lips; also, she is engaging in madal not whole-heartedly [she is only doing it due to not having any other means to attain him]. maNik kunRaththai – She is saying, “this made me engage in madal truthfully, not just for the sake of it”. He united with me bringing my natural complexion back and cooled me down, and made me not sustain myself even if the talk about separation came about – it is such state of his which made me engage in madal”. Enjoyable like an emerald mountain. AsaRu seelanai – She is saying “I did not become captivated just by seeing his beautiful form, but also on seeing his internal qualities”. Asu – blemish/fault. One who is having faultless qualities. Only if he united with me as if it is a benefit for me, I too, while in separation, could do what “I” seek out for; but such a great lord, taking an ordinary position, considered uniting with me as his own benefit; in such case, while in separation, can I think “I won’t leave him if he comes and I won’t search for him if I lost him”? When he maintains the perfection of his qualities, are you asking me to not eliminate the blame? Adhi mUrththiyai – When the friend said to her “As you are born in a high family heritage, instead of waiting for him to come, your becoming agitated is causing disrepute to yourself”, she said “I am not trying to cause disrepute; but I am trying to cause respect”; I am desiring for the entity which is singularly explained in SAsthram as in chAndhOgya upanishath “kAraNam thu dhyEya:” (meditate upon the origin/cause), and even if one perishes while trying to attain him, it is still respectable. Previously too, [nampiLLai] mercifully gave an explanation – As said in jithanthE sthOthram 1 “… pUrvaja” (one who puts in the initial effort for the uplifting of jIvAthmAs), while he puts in the initial effort to unite with us, should I not manifest suffering in separation before he does? Still, instead of saying “she got separated from her beloved lord, subsequently (immediately) she engaged in madal”, it looks like we have to say “she remained in grief for some time, and since she could not bear the anguish, she engaged in madal”. nAdiyE pAsaRavu eydhi – Am I suffering just today? I have been suffering for a long time. Whatever efforts he put in to attain me, my suffering in separation was more than that. Forever, I have searched and not seen him and thus ended up only suffering all along; like some will be born in prison and be raised there, my union with him is only a guess based on my separation from him. Only after having searched in all the places where bhagavAn is present, and not having seen him, have I engaged in madal. pAsaRavu eydhi – Having sorrow. pAsaRavu – sorrow. Also, pAsu means green colour (freshness) and aRu means losing, that is “I have attained different complexion (paleness) [in separation]; another explanation – pAsu means pAsam (attachment); i.e., she is saying “I have given up all attachments towards my relatives”. pAsaraveydhi – I have placed all my attachment on emperumAn. aRivu izhandhu enai nALaiyam – It has been a long time since I lost my wisdom. Did I not lose my [worldly] wisdom when you bestowed me with “mayarvaRa madhi nalam” (unblemished knowledge and devotion)? When I sent a thiryak (bird) as messenger, did you think that it was “gyAna kAryam” (an action in knowledge), to come and teach me now? Did I not become bewildered back then as said in thiruvAimozhi 1.4.3 “madhiyellAm uL kalangi” (having the mind totally bewildered)? He is such that, when one comes in contact with them, they will not know anything else, as said in iraNdAm thiruvandhAdhi 42 “pErinbam ellAm thuRandhAr thozhudhAraththOL” (the shoulder which is well worshipped by those who gave up all great pleasures). Not only he would make one forget about the material realm while reaching spiritual realm as explained in chAndhOgya upanishath 8.12.3 “nOpajanam smaran idham SarIram” (AthmA will not contemplate about the material body after reaching the spiritual realm), is he not capable of making one forget everything in this world when true knowledge dawns? Is he such that, one can think about him as well as worldly matters? The people who are being fearless about blaming her. The people who are anguished thinking “we have ended up blaming the one who is engaged in bhagavAn“. She who is beyond the blaming of worldly people. Uravar kavvai – Only if those who are engaged in bhagavAn consider this as a fault, it will be a fault; would the accusations presented by worldly people matter to us? thOzhi – Oh friend who considers my joy and sorrow as yours! only if you consider this as a fault, I will retract [I don’t care about others’ view]. en seyyumE – For me who is beyond these worldly accusations, what is the use of the words of such worldly people? We are situated at the stage which is beyond the praising/blaming of worldly people; are these accusations insulting to us? Don’t we sustain ourselves by these worldly accusations? It is said in kuRaL 1141 “alar ezhil [ezha] Aruyir niRkum…” (Our love gets sustained by the people’s accusations). As said in thiruvAimozhi 7.3.8 “alar thURRiRRadhu mudhalAk koNda en kAdhal” (my love which is sustained by the accusations of the people). This entry was posted in thiruvAimozhi, thiruvAimozhi 5th centum on June 13, 2017 by Sarathy Thothathri.